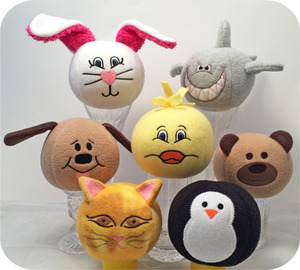 Our popular Snowman Snowballs have morphed into cute animals! Our popular Snowman Snowballs have morphed into animals! This set includes all 7 designs shown. They are made using fleece and can be tossed around harmlessly. They also can be thrown into the washer. The balls are 3D spheres. After the face and ears, etc. are stitched by your embroidery machine, the balls are sewn together using a sewing machine. Complete, detailed instructions with photos are included in this set. The bunny and dog ears, the tuft of hair on the chick and the sharks fins & tail are easily stitched on by hand. Don't worry, fleece is very forgiving when stitching. These are great toys for boys or girls. You can make these with either a 4x4 or 5x7 hoop. If you have a 5x7 hoop, the face file will stitch the cutting lines for the panel. You can then use this panel or the included pattern to cut 3 more panels needed for each ball. If you only have a 4x4 hoop, you will cut the panel using the included pattern and embroider the face onto it and then cut 3 more panels. The balls are stuffed with poly-fil. BONUS Instructions to make our adorable animal blankets are included. These will make the perfect baby gifts. 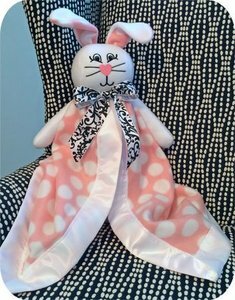 Add a name or monogram to the blanket to create a one of a kind special keepsake.